As you will have realised from reading Artista, I have a serious weakness for shoes. This isn’t a new addiction either. 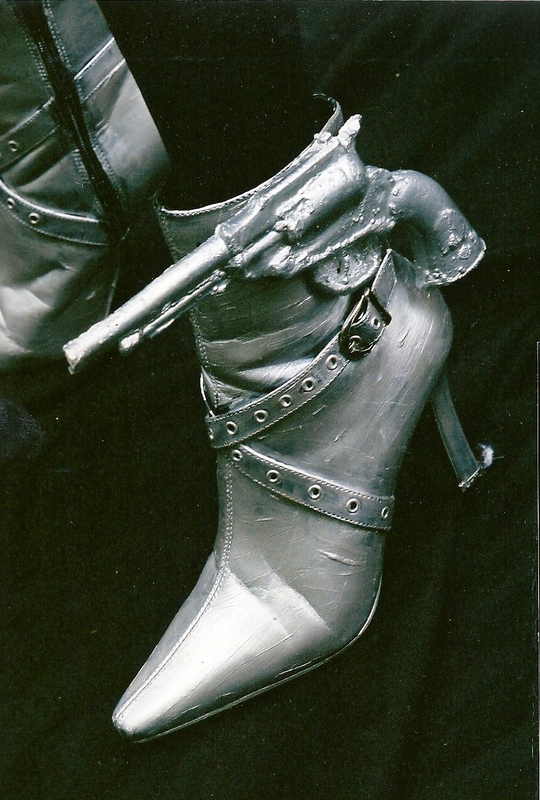 During my school days, I once donned Barbarella-inspired self-constructed silver boots for a fantasy fashion show. Nowadays, practicality plays more of a part (well, slightly) and I am usually found tottering around Mayfair in stilettos. My Barbarella-esque shoes on show a few years back. Own photograph. So, I am devastated (and, no, that’s not an exaggeration) that I am still ill at home and can’t visit this exhibition myself. It is surely one that would make my top 10 list for this year as it is an exhibition of spectacular shoes. Just because I haven’t been able to visit in person, doesn’t mean I haven’t been able to indulge and spend an inordinate amount of time salivating over the photographs. Shoes for Show in Brick Lane. Image via www.thisismission.com. High heels date back to the Egyptian times when the upper classes were thought to have worn a form of raised heel for ceremonial purposes. Over time, these shoes developed and progressed. In the 15th century, the chopine could be seven or eight inches high acknowledging wealth or social standing. The formal invention of the heel is thought to trace to Catherine de Medici who felt insecure when compared to the taller mistresses of her then fiancé, the Duke of Orléans. To give her more allure, she donned two inch heels and well and truly ignited the fashion. Now, heels are a familiar part of our culture, often in the press for their controversial designs or with safety warnings as models topple on the catwalk. 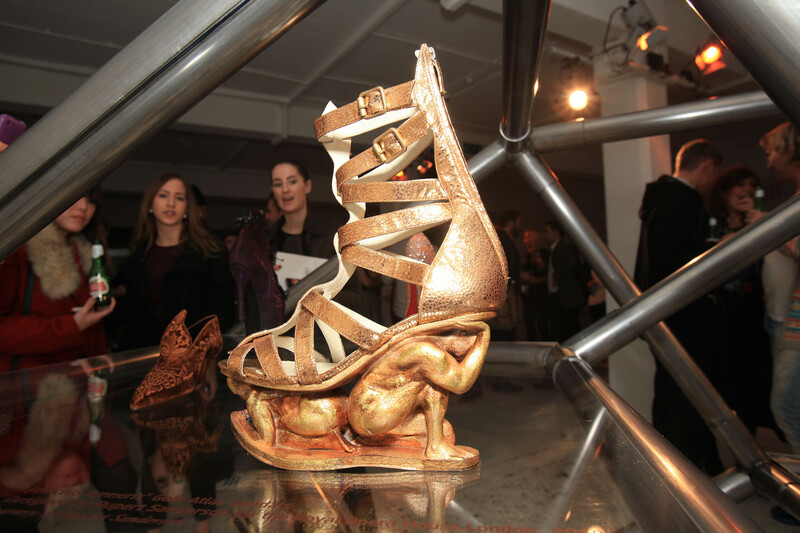 Beyonce’s shoe from the Rule the World video, designed by Gareth Pugh. Image via www.thisismission.com. 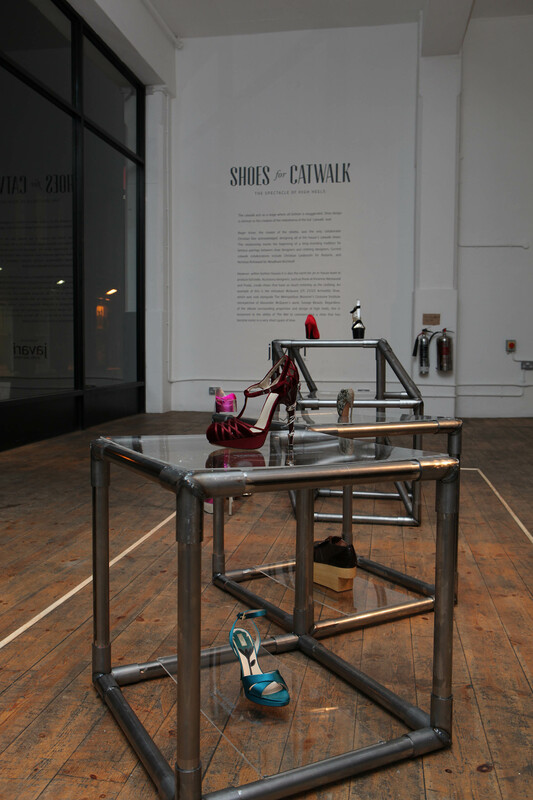 Catwalk shoes in the exhibition. Image via www.thisismission.com. The word stiletto comes from the Italian for a pointed dagger or knife and,the exhibition includes Roger Vivier’s classic 1950s shoe for Dior, often credited with being the first stiletto. Fittingly, Vivier was studying at art school and planning to be a sculptor when friends invited him to design a collection of shoes. This surely shows the sculptural element of these phenomenal designs. There is no doubt that these designers are artists. Yantourny, for example, only made shoes as art objects with each work taking two to three years. His only aim was to create a work that could be admired by future generations. 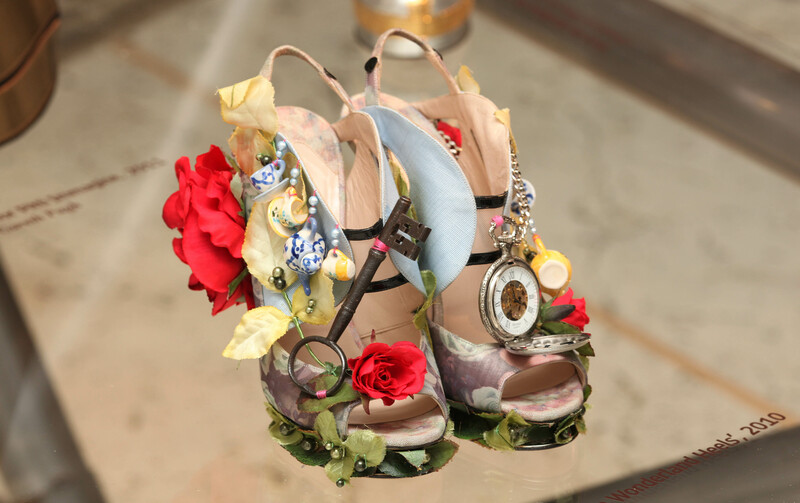 Many of these shoes are designed to make a statement such as, Rupert Sanderson’s designs for Verdi’s Aida at the Royal Opera House with figures from Greek mythology creating the undercarriage of the shoe. To be worn by Princess Amneris, they were designed to stand out like diamonds on a beach full of pebbles. Rupert Sanderson for the Royal Opera House. Image via www.thisismission.com. Christian Louboutin and Daphne Guinness shoes. Image via www.thisismission.com. These one-off designs are certainly artforms, capturing a range of designers’ sensational creativity. Nicholas Kirkwood’s Alice in Wonderland heels designed for the spectacular window displays at Printemps in Paris (that I was lucky enough to see last year) involved the designer travelling the length and breadth of the UK’s car boot sales to find trinkets for adornment. Nicholas Kirkwood for Printemps. Image via www.thisismission.com. For those of you who scoff and say is it art? For me, there is no doubt. The exhibition presents ‘sculptures’ that are a clever fusion of fashion, art and design and inspire a powerful need in visitors to go shopping. Even just viewing from my sofa, I’m having some serious shoe cravings. Make sure you’re wearing your best heels to strut along this weekend. Shoes for Show is at the Loading Bay, 91 Brick Lane only until 8th November 2011, http://www.trumanbrewery.com/cgi-bin/exhibitions.pl.